The urban setting of VCU allows for a huge selection of places to get a meal. Here are the top 5 rated restaurants within walking distance for VCU Students. The Black Sheep is a small, trendy restaurant tucked away into a decidedly unassuming neighborhood and is considered by many to be a staple of Richmond’s dining experiences. This hip, casual restaurant is perfect for students, tourists, and Richmond residents alike, offering a full bar and an inventive brunch, lunch, and dinner service. Chef and co-owner Kevin Roberts’ imaginative brunch menu has classic favorites such as French toast and pancakes sitting prettily alongside more diverse choices like a smoked trout egg scramble and fried catfish with a crawfish hollandaise sauce. While The Black Sheep’s brunch selections are to die for, the restaurant’s true appeal lies in its trademark “battleships,” or sub sandwiches. A full sized sandwich, running approximately $20, reaches an impressive two feet in length and can weigh a hefty two and a half pounds. Despite the higher price tag, customers are more than ready to dish out the dough for the impressive quality of the battleships. Each sandwich is named after a famous battleship and features a creative combination of ingredients, including the favorites peach chutney, banana ketchup, chicken livers, and roasted beets. Being away at college, whether it’s your first or your last year, can be a daunting and lonely experience. Sometimes all that’s needed to chase away the blues is a taste of home. Located a stone’s throw away from Pine Court Apartments, Comfort specializes in southern home-cooking with a creative, fresh take. The large, open, and airy dining room allows patrons to enjoy their food in a much more relaxed, unhurried manner. Orders are served in large portions, running about $16-25 including three sides. Guests can find all of their old favorites from crispy fried catfish and juicy pork loin to velvety macaroni and cheese and savory brussel sprouts. Guests rave about the desserts, especially the banana pudding crème brulee. All ingredients are locally procured and seasonal. Comfort also prides itself on its substantial whiskey collection, offering a diverse array of drinks to satisfy all who visit their full bar. Due to the popularity of Comfort, it can be difficult to snag a table so be sure to make your reservations early! Even college students need a place to celebrate special occasions. 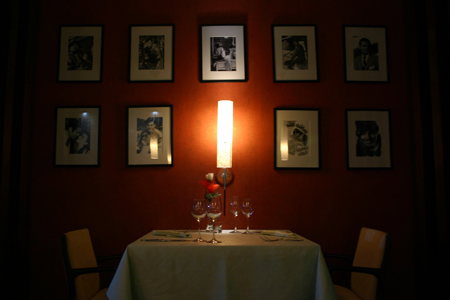 Adorned in simple, tasteful décor, Heritage is the perfect place for that special night. Opened in December 2012 by Chef Joe Sparatta and his wife Emilia, Heritage specializes in upscale, unique fare. Guests can expect succulent tender meats such as the luscious pork belly, named best in Richmond, to be served alongside creative appetizers like pork fries and pimento croquettes. Portions are separated into small, medium, and large dishes. Prices vary from $2-$19. In addition to a mouthwatering lunch and dinner menu, Chef Sparatta offers a slew of one of a kind brunch items. Patrons rave about the warm Nutella French toast and the flavorful smoked salmon eggs benedict. Guests are impressed by the knowledgeable, professional attitudes of the both the dining staff and bar staff. Sparatta is courteous to those with food allergies and will substitute a recipe upon request. Heritage is a hot spot in Richmond and reservations are always recommended. Established in 1955 by the original Nick, Nick’s Produce and International Food Market is a hidden gem in Richmond. Now run by his sons Manuel and Philip, Nick’s is a combination deli and Mediterranean food market. The establishment’s appeal lies in both elements, attracting customers with delicious, affordable food and its status as a reliable source of quality Mediterranean specialty ingredients. Within its comfortable, homey aisles, reminiscent of a traditional mom and pop store, are endless shelves of the best imported meats, cheeses, herbs, and wines from all across Europe and the Mediterranean. Nick’s deli offers a wide range of lunch items including sandwiches, soups, and salads. Nick’s best selling sandwich is the Sopressata Mortadella Prosciutto. Sandwiches run anywhere from $5 to $12 and soups or salads from $4.50-$20 based on size. Nick’s also offers homemade desserts such as spanokopita. Whether you’re spending every night up late studying for finals or are trying to battle rush hour on your way to work, everyone could use a little pick me up. Rev It Up provides just what busy students and employees need in the form of a quaint, friendly coffee house within walking distance of the VCU campus. The perfect environment for work or study, customers can enjoy a delectable array of coffees and teas alongside sinfully sweet pastries and cookies. Rev It Up also has a full brunch and lunch/dinner menu full of seasonal soups and salads, quiches, wraps, and sandwiches. Some of the most popular choices are the fish tacos, Reuben sandwich, and chicken salad. All dishes are made to order and are served quickly and efficiently. Customers rave about Rev It Up’s exceptional customer service and the friendliness of the staff and owner. The staff is also pleasantly accommodating to those who have food allergies. The owner offers free parking passes for a private lot located behind the café for easy parking.